Why I Choose HostGator rather than MERCUMAYA.NET Web Hosting? There are a few reason why i choose Hostgator rather than my local Webhosting service, MERCUMAYA.NET that hosted at Malaysia. At HostGator, you will be provided the best webhosting service because of many reasons. 1. Hostgator offer technical support at all hours of every day. While MERCUMAYA.NET did not pick up the phone after office hours. 3. Hostgator used up to 16 CPUs for their shared hosting server, but MERCUMAYA.NET use only 4 CPUs. 5. Hostgator shared hosting server allowed to to configure php.ini if required using “php.ini QuickConfig” but MERCUMAYA.NET not allowed you to change since all the php.ini control by them 100%. However, i still use Mercumaya shared hosting service for Bahasa Malaysia’s blogs as my target visitors is mostly come from malaysia. So it is better to use malaysia webhosting service for better network performance since it nearest. Other reasons why i still use Mercumaya service are the price of domain name and the price of shared hosting packages. It actually more cheaper if compared to other Malaysia webhosting provider such as www.internet-webhosting.com, www.serverfreak.com and www.datakl.com. The information above is based on my experiences only. of course i would recommend you to choose the best web hosting service provider for better performance and support. From now on, Mercumaya.Net should improve and upgrade their webhosting server. Disqus is a world favorite comment system and discussion platform that improves discussion on websites or blogs and connects conversations across the web. It is free to register and you can install more that one websites in one account. 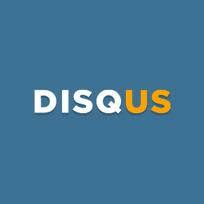 In this post, i will share on how to install Disqus on WordPress blog. 2.Go to disqus.com. Please register if you don’t have free account. You can proceed to login if you have an account on disqus.com. 12. Now you blog has been installed and configured with disqus. HiStats is very easy to install. First you register, then pick a counter style and lastly paste the code into your blog. In this post, i will show on how to install b2evolution blog on Linux. This howto used Red Hat Enterprise Linux 6 as a sample, therefore it’s should be working on other linux distributions as well. b2evolution is an advanced weblog tool, i-e software allowing you to run your own blogs, newsfeeds or even photo stream. It is a medium scale CMS centered around the blog concept and fully featured with multiple blogs. Follow the following steps to install b2evolution blog on Linux. Preparing to install .htaccess ... ERROR! Everything should still work, but for optimization you should follow these instructions. Creating default blacklist entries... OK. Creating user field definitions... OK.
Activating multiple sessions for administrator... OK. Creating default Post Types... OK. Creating default file types... OK.
Activating selected default locale... OK. Creating default scheduled jobs... OK. Creating default "help" slug... OK.
Assigning avatar to Admin... OK. Creating demo blogger user... OK. Creating default group/blog permissions... OK. Installing default widgets for blog #1... OK. Installing default widgets for blog #2... OK. Installing default widgets for blog #3... OK. Installing default widgets for blog #4... OK. The /cache folder could not be created/written to. b2evolution will still work but without caching, which will make it operate slower than optimal. Note that password carefully! It is a random password that is given to you when you install b2evolution. If you lose it, you will have to delete the database tables and re-install anew. There are two methods to install Joomla 1.7 on your webhosting. First method is with the automatic installer from the webhosting’s application that’s already included in the control panel, also called cPanel. Second method is manually install from the web hosting server. In this post, i will show you on how to install the Joomla 1.7 using cPanel. CMS URL will be as below : http://domain. In this post, i will show you step by step to add your blog to Technorati. This will help to increase a blog traffic. 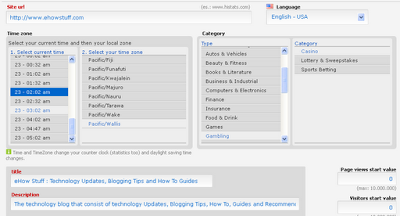 According to wikipedia, Technorati is an Internet search engine for searching blogs. 3. Your will have to verify your email address in order to proceed. 4. 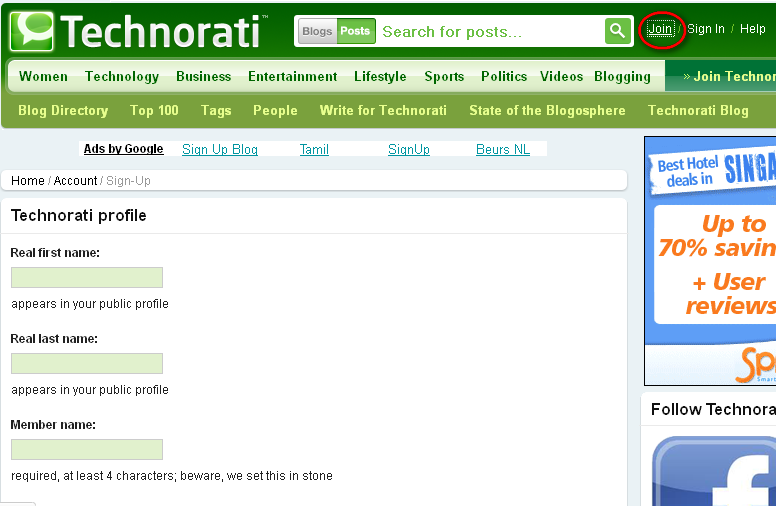 Login to your Technorati account. 5. Click on the username. 6. Please fill in the ” Start a blog claim” with your blog URL. Then click Claim. 7. Fill in the necessary details for your blog. 8. Click ” Proceed to the next step”. 9. Open your email again and look for claim token code. 10. Put claim token code xxxxxxxxx into blog post. This is compulsory. As an example : 4GHJT63H25ZN. 11. Click Check Claim to proceed. 12. Then click ” Verify claim token”. 13. Your blog still evaluating by Technorati team. In this post, i will share on how to delete Facebook fan page. 1. Once you have logged in to Facebook, go to the fan page you want to delete. Click on the “Edit Page” button at the top right hand corner of the Page. 2. Looking for Delete page and Click “Permanently delete……”. 3. By clicking “Permanently delete” you will get a warning message and by pressing delete your facebook page will delete permanently. Serendipity is a PHP blog application which gives the user an easy way to maintain an online diary, weblog or even a complete homepage. It is very simple application and very easy to install. In this post, i will guide you on how to install the serendipity on CentOS 5.5 with apache, mysql and php installed. 4. Run the installation wizard as below. 5. Proceed to the installation wizard until below page.